Restaurant Rewind - Olive Garden: Friends joined me in the kitchen to recreate some restaurant favorites of Olive Garden. Surprisingly, some of these homemade recipes were even better than their restaurant counterparts! Check back everyday this week for the recipes of the dishes we recreated. Movable Feasts: Childhood Favorites, Reinvented! - My friends Jen and Wayne co-hosted this potluck dinner where we got together and brought a dish from our childhood with an updated twist. Dishes I prepared included a Pumpkin Bread Pudding with a Caramel Sauce and Cordon Bleu Croquettes. Chicago Cupcake Crawl of 2009 - Probably the most exciting of my weekend culinary adventures, friends and I had a blast with our sugar high from all the cupcake shops around the city we visited. Check out where we went, what we thought and pics of some amazing cupcakes found here in Chicago! This week's freebie is dedicated to all of us who are kids at heart. I'm sure there are quite a few of us that enjoyed peanut butter and jelly sandwiches throughout our childhood. Peanut butter was probably one of those ingredients solely purchased for sandwiches, if not cookies or other baked treats. Oddly enough, when there was peanut butter in our kitchen growing up, it wasn't really for sandwiches. Instead, it was a key ingredient for a Filipino dish called Kare-Kare, a peanut butter based stew. I'd often take the opportunity of snagging the peanut butter to make sandwiches when my mom wasn't looking. Now in our house, my husband detests peanut butter. He won't go near it with a 10 foot pole and even the smell of it skeeves him out. He says that when he was eating Kare-Kare growing up, it wasn't a fond memory. So with a husband who can't stand peanut butter, I don't usually have it as part of my kitchen staples. Sad, isn't it?! - What is your favorite way to enjoy peanut butter? Sandwiches? Cupcakes? Cookies? Something else? Deadline: Thursday, September 24, 2009 at 12 midnight CST. ONE WINNER will be randomly chosen by Random. Org's Interger Generator based on the number of your comment and will be announced on Friday, September 25, 2009. Good luck! I love the combo of peanut butter and chocolate so pretty much anything with those two together, you can't go wrong. I love dipping celery into peanut butter, that's my favorite! And that caramel apple PB sounds sooo good! Honestly, my favorite way to enjoy PB is straight out of the jar with a spoon! My favorite way to enjoy peanut butter is for sure a peanut butter and jelly sandwich. I'm pretty generic...there's NOTHING like a good PB&J sandwich! I'm a fan of the peanut butter sandwich but I have to agree with Erin, straight out of the jar is good too!! I love to eat peanut butter in a bowl with a little bit of honey drizzled in YUMMY!! Crunchy is best eaten with a spoon. Creamy is soo good in icing over a moist chocolate cake. Yumm! peanut butter and bacon toast. YUM! peanut butter and apples is my fave healthy snack...but peanut butter and chocolate is my guilty pleasure! PB can be enjoyed in any way in my book from a PB&J sandwich to a piece of celery...or just sticking a spoon into a jar is a great snack in my book. My favorite has to be adding a piece of chocolate to the spoon of PB - YUM! I love eating it straight from the jar with a spoon!! MMM YUM! What an awesome give away! My favorite way to eat peanut butter is straight out of the jar plain ;-) but I also love it in a sandwich with peanut butter and bananas! peanut butter is my weakness! I love PB & banana sandwiches for breakfast or before a big run. I also love the classic PB&J. For snacking, I like slicing an apple & dipping it in melted peanut butter. I must confess, I eat peanut butter almost daily. Peanut butter and fluff on saltines is heaven! I love peanut butter spread on slices of green apple. YUM!!!! I like ot have peanut butter on toast topped with banana slices - its my go-to meal before a long run! I love peanut butter on just about everything, but I think my favorite is on celery sticks. Yum! On a piece of thick bread, layer peanut butter, bacon slices, and banana slices, and then drizzle honey over it all and top with another piece of bread. Butter the outside of each piece of bread and fry in the pan that the bacon fried in until golden and crispy on both sides (like a grilled cheese sandwich). It's SOOOO delicious-- you cannot be a hater and proclaim it to be disgusting until you've actually tried it! *Warning: do not consume if you have heart disease or have previous history of heart attacks, because this just might stop your heart! any combination of peanut butter and chocolate! I actually don't like PB (gasp!) but DH eats it just about everyday. One of his favorites is the Taffy Apple Pizza recipe from Pampered Chef! My own, completely unhealthy version of peanut butter and fluff--I take the large marshmallows and dip them in the peanut butter. Fantastic! Either that, or I get Wilton's peanut butter flavored melting candy for cake bites, but I am not sure if that counts. yum, I love PB! I eat it in sandwiches, add it to various dessert recipes, and eat it with apples. mmm, Peanut butter on a freshly made piece of toast, so that the peanut butter is warm and gooey. My favorite way.. is the classic spoon stolen from the jar! I love melting peanut butter and then putting it on my ice cream. My way is PB and banana on toast or english muffin drizzled with honey YUM! I have been eyeing these PB's online for a while. My favorite way to eat PB is as a fluffanutter. It is a peanut butter and marshmellow fluff sandwich. I usually eat them for breakfast. I love peanut butter pretty much any way but I think my favorite is cookies with a big glass of milk! I like a big glob of peanut butter on top of hot oatmeal. It kinda melts into the oatmeal and is absolutely divine. I love mixing peanut butter in my oatmeal on mornings I need a little something extra to start the day. I love peanut butter in general, but there is just something comforting about a good ol' peanut butter and jelly sandwich. It just brings me back to my childhood. I looove peanut butter fudge or peanut butter on toast, but my favorite has to be my own signature peanut butter frosting that I use for my chocolate peanut butter cupcakes! But I'd have to say one of my favorite ways is on vanilla ice cream, with chocolate syrup and broken sugar cones. Delicious! On toast has always been a childhood favorite, but lately its mixed into oatmeal for breakfast. So comforting on cold mornings! Traditional PB&J with strawberry jelly! I LOVE peanut butter. I wish it wasn't so fattening...that doesn't stop me from eating it though. I love pb and honey sandwiches, pb and syrup sandwiches(yes syrup),pb and fluff, pb and banana, pb and chocolate,and I could go on and on. I can remember my Dad eating pb and bologna sandwiches. I thought that sounded gross too.What can I say though. He was from Louisiana. peanut butter and banana sandwiches! definitely. On a spoon with some Nutella! Peanut butter chocolate chip brownie chunk cookies. The recipe only calls for 1 cup of peanut butter, but I ALWAYS use the whole jar! YUM! I think my favorite is always going to be a peanut butter and jelly sandwich. That or in a Reese's Cup! Any combo of PB and chocolate is winner - especially in ice cream or cookies. Yum! Just saw these at the store the other day. Yum! I love peanut butter cookies. PB & banana sandwich or PB & marshmallow fluff!! And if I'm really hungry just a spoonful of PB with a few chocolate chunks on top! In a spicy peanut sauce over some kind of noodles or tofu. I like my peanut butter in savory dishes and hated it in sandwiches growing up. I love PB in every way... but I love a chocolate cookie dipped in PB or a PB coated apple... or a PB&J sandwich... or PB cheesecake! it's goes on, and on, and on! great giveaway! peanut butter and apples, I love it! Do reese's peanut cups count??? I figure why reinvent the wheel!?! my Favorite way is my peanut butter dipping sauce for spring rolls! Peanut butter is my favorite! I love it on a piece of fresh, homemade sandwich bread. And a glass of milk! You will think I am crazy but I have not eaten a peanut butter sandwich in my entire life. I like it on crackers, toast or English muffins. My favorite way to consume pb is via a peanut butter cookie. MMMM! Toast cinnamon raisin bread and crunchy peanut butter sandwich! Peanut butter with apple slices! The best way to eat peanut butter in my opinion is straight from the jar on a spoon into my mouth. YUMMYYYYY!! These flavors look so delicious! I am a purist. Straight out of the jar. If forced to make the pb last longer, it is pretty tasty on unsalted premiums. Peanut butter and jelly toasted sandwich! 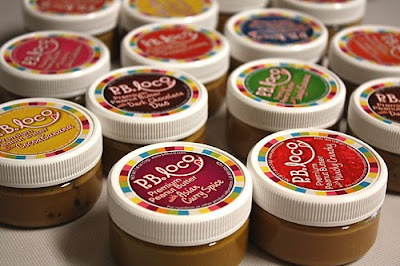 Straight out of the jar :) I've had PB loco PB before and really love it, especially the white chocolate raspberry - yum! As a fellow filipina, I love Kare Kare. But it's a tie for peanut butter & granny smith apples & Peanut Butter & Jelly sandwiches. I love it on apples, but ever since I became prego, right off the spoon works for me! My favorite way to eat peanut butter is on a piece of freshly baked whole wheat bread, with a little grape jelly to top it off! for the longest time i been having a craving for peanut butter and pretzels. but right now i been eating a lot of the candy mary janes. loving the peanut butter and molasses. Smeared on a banana bite by bite. On bread, with marshmallow fluff - fluffernutter. Heaven. I love peanut butter on a toasted English muffin with a sliced banana on top. PB swirled in vanilla bean ice cream is divine. But, you can't go wrong with a classic PB & J!! Any way! I love PB! On bread, on waffles, a roll,a rice cake, a spoon, my finger! I love to toast up 2 waffles and make a Peanut Butter and Jelly sammy on them... the peanut butter gets all gooey and melty! On a spoon, straight out of the jar! My favorite way to eat peanut butter (crunchy please) is on top on pancakes with lots of syrup. Mmmm. I love my PB on toast! definitely on toast with strawberry jam...although I saw a muffin recipe today that involved bananas, chocolate and peanut butter that sounds yummy enough to try. I love peanut butter with a crisp, just picked Gala apple. I love peanut butter on toast! OOO, I love peanut butter with banana slices on toast with a glass of ice cold milk on the side! I love peanut butter any way it comes. My favorite though, is peanut butter and honey sandwiches. On whole wheat english muffins with sliced bananas! I put a spoonful in my oatmeal every morning. I also love a good pb&j! I love Peanut Butter on celery.. or just a big heapin' spoonful plain. I love peanut butter mixed with chocolate, pretzels, and ice cream. Yum! Do I really have to pick just ONE way that I enjoy peanut butter? 1. An english muffin with slices of banana. 3. In a reece's pb cup. Hey Jolene, I LOVE your blog!!! Peanut butter is my favorite, I eat it everyday, either on a cracker, sandwich, celery, I also love to add PB to sauces. I hope to be able to try PB Loco. I enjoy peanut butter in pretty much any way! If I had to choose a favorite it would peanut butter with chocolate. On graham crackers or on celery with raisins. My all time favorite is peanut butter on pancakes with syrup. It is absolutely delicious and I have loved since I was a child. Peanut Butter on Toast with a thin spread of Strawberry Jam. Yummy! Dude...peanut butter on ANYTHING!!!! I don't think I could pick just one thing :o( I guess if I have too, probably peanut butter fudge! I'm really basic. I like my peanut butter on a slice of potato bread. That's it! Hopefully 99 is a lucky number...all of those flavors sound AMAZING! I love LOVE PB on anything...for the past couple of weeks it's been a regular for me for breakfast. On toast, with Trader Joe's Blackberry jam...yum! I love to eat pb with Nutella in croissants. I love peanut butter on a spoon - for dessert, nothing beats peanut butter sundaes! There are so many great things to do with it, but one top comfort food is to smear PB and honey on a tortilla and to warm it in the microwave for about 30 seconds. I'm always amazed how many people have never tried the PB/honey combo... amazing!! I really enjoy PB in candy. Homemade Peanut Butter balls are so tasty! On apples or with chocolate. Yum! My favorite is to mix PB with a little honey and something crunchy (like crushed corn flakes or grape nuts) and spread over apple slices. YUMMY! My favorite is peanut butter on a banana, but there are a lot of close seconds. ohhh I Love peanut butter! I like to put it on hot toast and let it get all melty and goey! These look like great christmas gifts and stocking stuffers! I've never heard of them before!